The armor of choice when it came to the 15th century soldier was a marked improvement from earlier eras. After all, this 15th Century European Cuirass certainly looks to be quite the effective armor, one that would afford a great deal of personal defense. This impressive cuirass is modeled after the typical foot soldiers armor of the late middle ages, which took full advantage of the protective power of steel plate. This armor consists of a breastplate and a back plate, both of which are crafted from 16 gauge steel. The armor itself is crafted with use in mind, being fully capable of withstanding contact reenactment and sparring. The breastplate features a subtle pair of riveted curves along the midriff, as well as an integral fauld that provides a bit more protection around the waist. 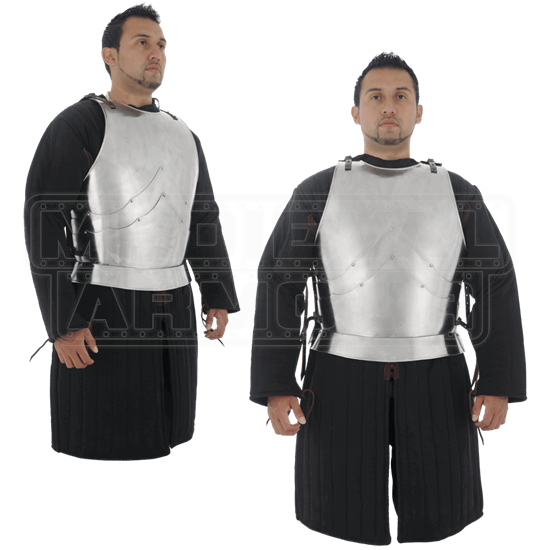 The breastplate and back plate are secured together via adjustable leather straps, which ensure that this protective cuirass can be resized to fit a variety of warriors. Both the cuirass and the back plate measure approximately 24 inches across. If you are looking for a good, solid start to your armor or just want something to keep your core and torso protected, then look no further, because this 15th Century European Cuirass will give your front and back a potent defense, leaving you to worry about your offense.